Author(s): Yinghua Yu, Jiajia Yang, 3-1-1 Tsushima-Naka, Kita-ku, Okayama 700-8530, Japan. Hiroki Matsumoto, Jinglong Wu. Background: When we use our fingers to explore the fine surface (spatial features smaller than 200 m) of an object, the relevant temporal features are encoded by cutaneous mechanoreceptor afferents that are widely believed to lead to the perception of roughness. However, whether visual input influences the haptic perception of fine surfaces and how the haptic and visual modalities interact with each other are questions that remain unanswered. Objective: In the present study, fifteen healthy volunteers participated in a series of unimodal (haptic-haptic (HH) task and visual-visual (VV) task) and bimodal (haptic- haptic & visual (HHv) task and visual-visual & haptic (VVh) task) fine surface roughness estimation tasks. Methods: The subjects were asked to estimate the roughness of a test surface that they compared to a standard surface in the HH and VV tasks. 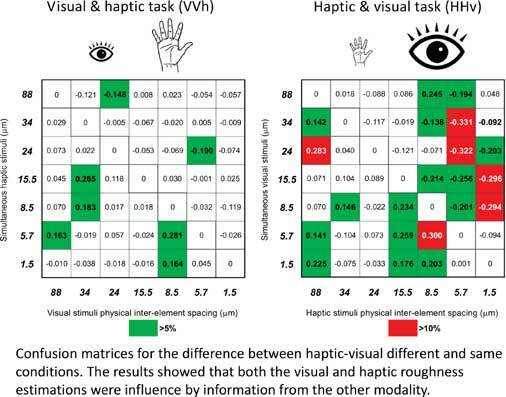 In the HHv and VVh tasks, the task procedures were the same as those in the unimodal tasks, but both haptic and visual surfaces were presented simultaneously. Results: Our results suggest that both the visual and haptic roughness estimations were influence by information from the other modality. Conclusion: In conclusion, we propose that humans store a modality-independent and dimensionless quantity in the brain when estimating the roughness of a fine surface. Keywords: Touch, vision, haptic-visual crossmodal, texture perception, fine surface texture. Affiliation:3-1-1 Tsushima-Naka, Kita-ku, Okayama 700-8530, Japan. Keywords:Touch, vision, haptic-visual crossmodal, texture perception, fine surface texture. Abstract:Background: When we use our fingers to explore the fine surface (spatial features smaller than 200 m) of an object, the relevant temporal features are encoded by cutaneous mechanoreceptor afferents that are widely believed to lead to the perception of roughness. However, whether visual input influences the haptic perception of fine surfaces and how the haptic and visual modalities interact with each other are questions that remain unanswered.